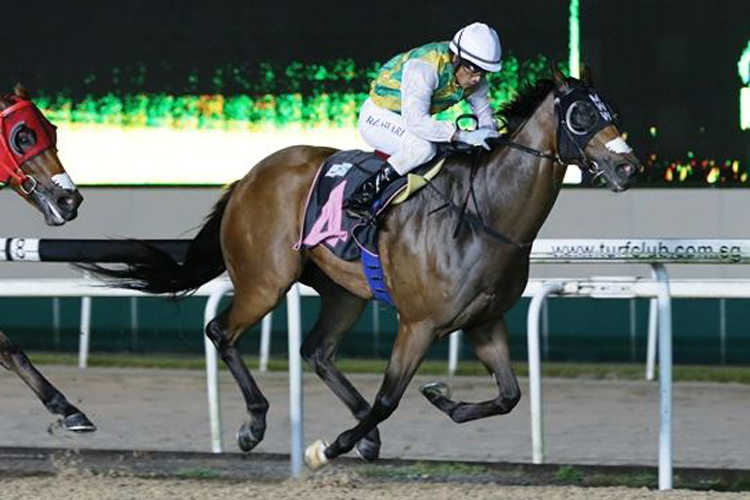 Distinctive Darci looks hard to beat when he lines up in the Kranji Stakes A (1200m) on the polytrack tonight. The Mark Walker-trained runner who won in Group 2 company last campaign resumed in good order when runner up over 5 1⁄2 f in similar company last start following a slow start. Vlad Duric remains on board and from barrier eight he will look to have the five-year-old a bit closer than he did last start when charging home late over the concluding stages. Distinctive Darci does his best racing on the polytrack where all nine of his wins have come and if he runs up to his last start effort he will take a power of beating in this. The five-year-old gelding does have the big weight of 131lbs to carry but he is easily the best horse in the field and he looks well suited to return to the winners circle. Captain Jamie shapes up as the main danger with just the 111lbs today on the back of a narrow win in a Class 3 over this C/D last time out. The Ricardo Le Grange-trained runner has since gone on to win a barrier trial over 5 f and from the wide draw expect him to push forward and be handy in the run. Captain Jamie does not win out of turn but he is racing in good form of late and was not far away from Mr Clint when third in the Group 1 Guineas over the mile. On the back of some strong recent form with just the 111lbs to carry in this field he profiles well for this race and will give Distinctive Darci a stern test over the concluding stages. Sir Isaac had just the two starts last campaign before resuming in good order when runner up in a Kranji Stakes C over 5 f last start. Goes up to the 6 f today where he has placed in seven of 12 and he is yet to miss the placings from all four runs on the polytrack. Takes on a much tougher field today and is over a year since his last win but he is another with just the 111lbs and he has shown enough in recent times to suggest he will be competitive in this. Siam Sapphire rounds out the main chances on the back of two solid efforts on the turf this campaign. The five-year-old gelding is a much superior horse on the polytrack where all five previous wins have come and he also goes well over the 6 f trip. Siam Sapphire has won two from three when third up previously and he should be ready to fire now third up from a spell.